Example of plastic material model, showing hardening and softening phases. Plastic material models are still scarcely employed in structural analysis. Many engineers try to avoid the use of nonlinearity as much as they can! Nonlinear material models, contact problems, damage, acquired the fame to be features difficult to control, to lead to unreliable results, to be very complex to set up, and, thing that no engineer likes very much, to make your simulation NOT converge. However, nonlinear material models are very powerful! They can lead to much more efficient and convenient designs. In my opinion, there are at least 5 very good reasons TO USE nonlinear material models in engineering calculations. Here they are! 1. The nature is NOT linear! Linear elasticity is the first approximation used in Finite Element Analysis (FEA) to describe the behavior of any structure. This is an excellent idea, since most of known materials have linear elastic behavior, at least for very small deformations. So, you can apply the Hooke’s law, and most probably you can always find a solution for the problem you are simulating! First of all, if you unload your structure, it will not have the same shape as before, since the plastic deformation is not reversible. Second, your problem becomes nonlinear, and this has many consequences! One of the most important, is that the superimposition principle is not valid anymore. Therefore, if you have two loads (A & B) to apply to your structure, applying first A and then B could NOT be the same as applying first B and then A! To simulate plasticity and thus get reliable calculation results, engineers and mathematicians developed several theories. 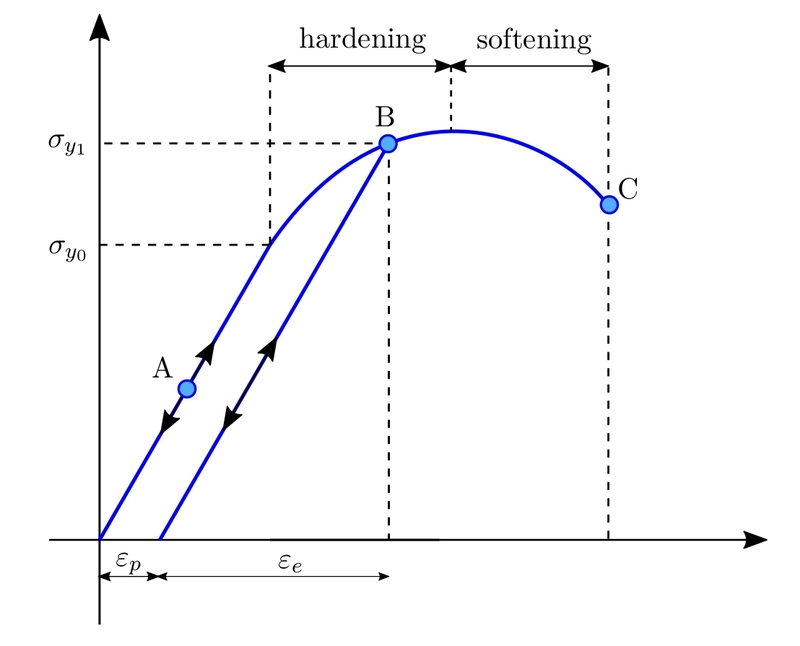 One of the most used in Finite Element Analysis is the so-called flow plasticity theory. This theory assumes that a flow rule can be used to determine the amount of plastic strain in the material. Furthermore, in this theory we must define a so-called yield surface. 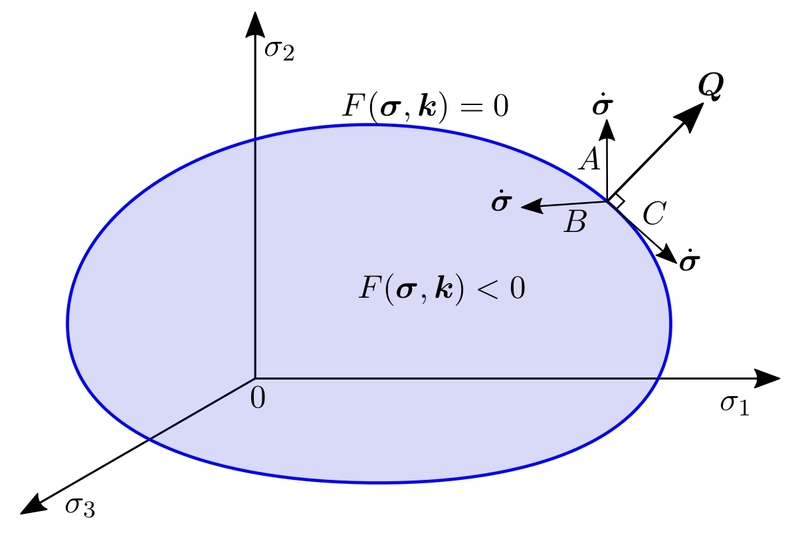 The yield surface divides the purely elastic domain from the elasto-plastic domain. Roughly speaking, this surface determines the yield strength of a material, for example steel. Example of yield surface in the 3D space of principal stresses. If there is hardening in your material model, once the material develops plastic strain, the yield surface will increase its size. In this way, if you unload and reload, you will see that the linear behavior of the material lasts longer. Exactly what happens with cold-formed steel. Otherwise, if the material shows softening, for example before failure or due to temperature increase, the yield surface will shrink. In this way, the material strength results reduced. So, everything sounds very complicated. Let’s speak now about some advantages. Comparison of stress-strain curves in experimental tests and simulation. When plastic strain starts to develop, the stress-strain curve usually become less steep. We can catch the correct behavior of the material only with a model that is able to represent this variation of stiffness. As shown in the picture above, advanced material models with properly identified material parameters can describe exactly this nonlinear behavior. In a point where the material yields, or develop plastic strain, we will have much higher stresses than in the reality. This will lead to higher internal forces (e.g. the bending moment) in the structure and possible oversizing during design. If a point of the structure resists less than assumed, where does the force go? The force will most probably redistribute in some other parts of the structure. There, stresses will be higher than expected! So, by assuming elastic material behavior, we could accidentally undersize relevant parts of the structure. in mechanical engineering, the correct behavior of the mechanical parts depends on the mutual movement between the components. Excessive movements can lead to malfunctioning. Neglecting inelastic deformation usually make the structure stiffer than it is. As it is possible to see in the video above, the natural consequence is that, by modelling the structure as linear elastic, we can underestimate the real displacements of the structure. As stated above, plastic material models usually lead to higher precision of FE simulations. The natural consequence is that we are closer to the real structural behavior. We can therefore better predict the effects of different load combinations and we need less assumptions and approximations during design. The results are higher quality designs, more durable structures requiring less renovation and maintenance and devices that last longer. 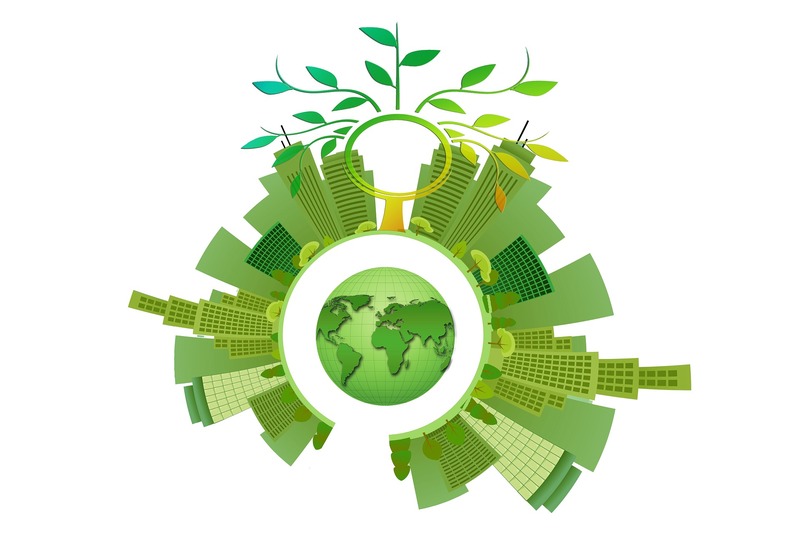 We can save resources, energy, labor and time and obtain better sustainable progress with great advantages for all of us. 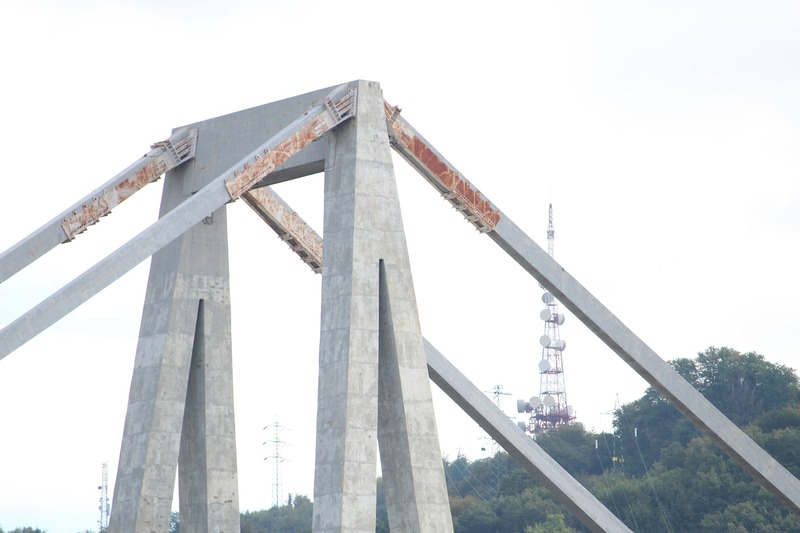 The Morandi bridge in Genova, which collapsed on 14 August 2018. The last and maybe most important point of today’s post is related to safety. The higher result precision that we obtain with plastic material models already enhance safety, but there is more. As mentioned in the first paragraph, when we calculate using linear elastic behavior, our simulation is most probably always returning a solution. This is due to the fact that, the more the structure deforms, the more it resists. This is not the case, when we use plastic material models, and it is a good thing! Most often, the reason why a nonlinear FE simulation fail to reach convergence is that static equilibrium cannot be found. This can be due to the development of plastic hinges, that compromise the structural stability. Therefore, advanced plastic simulation provide to us an additional way to ensure that the structure is safe and durable. This entry was posted in Simulation, Structural analysis and tagged engineering, FEA, Nonlinear modelling, Plasticity, structural analysis by Max. Bookmark the permalink.